I pulled this one out from the archives as proof. I’ve written once about being a big mouthed goof, especially when I’m enjoying myself. This happens without fail whenever I go contra dancing and so I’m planning on having some awfully sore smile muscles after the techno contra taking place at High Mountain Hall in Camden this Friday. Grand Banks Entertainment is pulling out all the stops for this one. 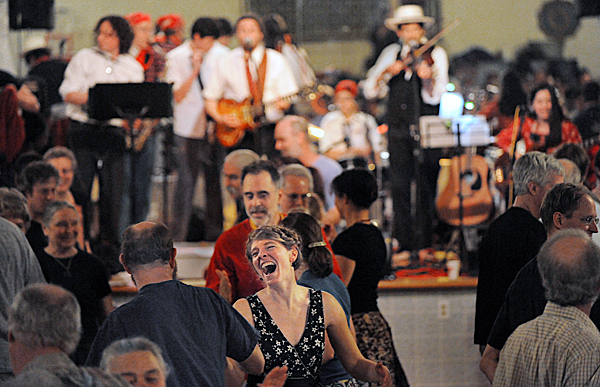 They’ve booked Perpetual E-Motion, a duo from Maine who are arguably the country’s most exciting and sought after contra dance band and whose music was featured in this NPR news story on the resurgence of this type of folk dancing and its music. Friday’s gonna be a fun one, folks. For more information on the event and to purchase tickets visit High Mountain Hall’s event page.